The railroad is a relatively safe form of transportation. Each day, trains transport goods and thousands of people across the United States. Unfortunately, as with any form of transportation, trains come with the risk of accidents, injuries, and death. The Federal Railroad Administration (FRA) reported that approximately 3,000 people are involved in train-related accidents in the United States on an annual basis. According to the National Transportation Safety Board (NTSB), in 2012 a reported 803 of these accidents were fatal, causing death to a train passengers, motorists, individuals walking near railroad tracks, or employees of the railroad. If you or a loved one has suffered injury in a train accident, it is highly important that you contact a Pittsburgh attorney with experience in this type of case. Collisions with cars or pedestrians can be particularly devastating, given the sheer size and weight of a typical train. If victims do survive, they usually suffer extremely serious and often permanent injuries. Because trains regularly transport goods and people, they are considered to be common carriers. Under the law, common carriers have a duty to ensure that passengers and cargo safely arrive at their destinations. Additionally, train operators have a duty to operate the train in a manner that will keep motorists, pedestrians, or other individuals reasonably safe. Finally, train companies and operators have a duty to always comply with federal safety regulations set out by the FRA. If a train company or operator violates any of these duties and causes injury, they should be held liable for their negligence. Structural defects or improper maintenance of the track. These are only a few examples of common train accident causes. Cases involving train accidents can be very complicated, as determining the true cause of the accident may be challenging and large railroad companies may try to avoid liability. For these reasons, you should always have an experienced train accident lawyer handling your case. If you have been injured in a train accident, you likely have suffered severe injuries that require extensive medical treatment and that may have even left you permanently disabled or disfigured. 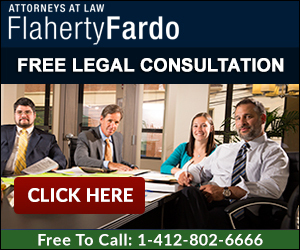 An experienced train accident attorney at the office of Flaherty Fardo can help you recover for all of your economic and noneconomic losses from the responsible party via a personal injury lawsuit. Additionally, if you have lost a loved one in a train accident, we can help you file a wrongful death claim and obtain proper compensation for your loss. We offer free, no-obligation consultations, so do not hesitate to contact our office today at (412) 802-6666 for help. Injury Details Please explain how the accident / injury occurred?